Katharine & George Alexander Community Law Center has raised $ 32,145 from 25 gifts! 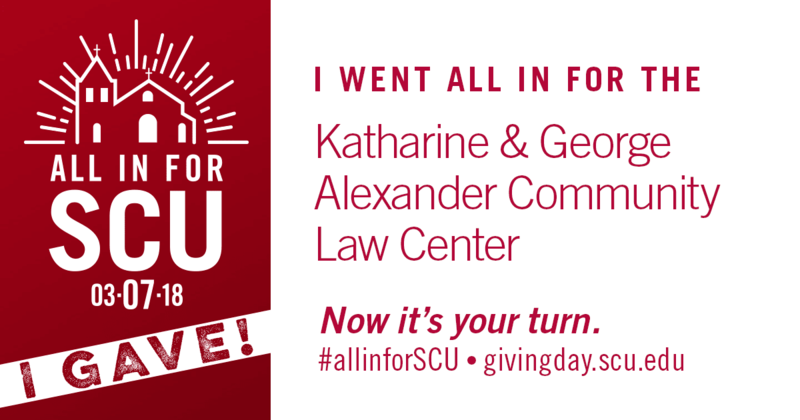 ARE YOU ALL IN FOR THE KATHARINE AND GEORGE ALEXANDER COMMUNITY LAW CENTER? YOU can help build momentum for the causes you care most about by saving the image below and sharing it on your social media sites to show your Bronco pride! The Katharine & George Alexander Community Law Center (KGACLC) responds to the need for affordable legal services within Santa Clara County’s most marginalized communities. Today, faced with the dramatic changes in our political, social and economic landscape, KGACLC renews its commitment to educating law students in the highest professional and ethical standards while serving the legal needs of the local low-income community. By ensuring that the most vulnerable consumers are protected from unscrupulous business practices, that workers are paid for their work and treated equitably, and that immigrants are offered accurate legal advice and high-quality representation, we also ensure that our law students become effective attorneys and lifelong advocates for social justice. GO ALL IN with the Katharine & George Alexander Community Law Center so that together we can continue to build unity through justice and education.